Captain America is digitally sculpted and 3D printed. Statue inspired by the artwork of Skottie Young for Marvel Comics. Captain America makes many of his fans feel like kids again, but this time, Gentle Giant Ltd. is having some fun by giving Cap a childlike appearance! This adorable version was digitally sculpted, and then printed on state-of-the-art 3D printers. 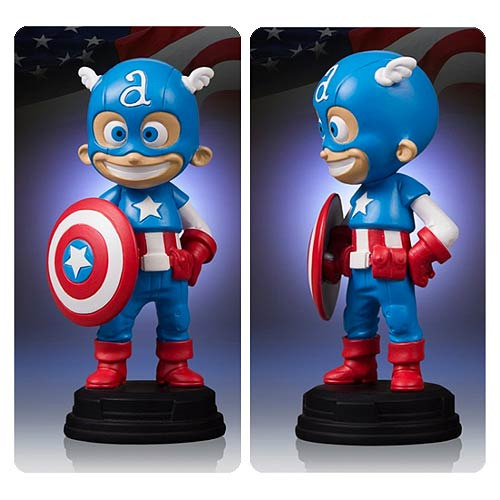 The prints were then used to create the prototypes needed to produce this fun-filled statue of a triumphant and very happy Captain America. This is the first in an ongoing line of Marvel Comics characters produced by Gentle Giant in this size and style, inspired by the work of Skottie Young. Ages 13 and up.